I got to Bombay last night and nursed sanDRina with a leaking carburetor to Arunoday Singh’s place in Juhu. He’s an old Kodai School friend and after studying acting in the US and the UK, he’s started his career as a Bollywood actor. sanDRina’s carburetor started acting up in the last few days. Her float bowl was over-flowing and she was running very rich (too much fuel in the fuel-air mixture). I couldn’t get her to idle at the stop lights through Bombay’s traffic. Bharat from the Madras Bulls put me in touch with a local Bullet rider and he told me that Anthony (pictured) was the best bike mechanic in Bombay. Anthony also adjusted my loose shift lever with an interesting technique of widening the upper end of the bolt hole so that it would pinch tighter. I can see why he’s revered by the bikers in Bombay. 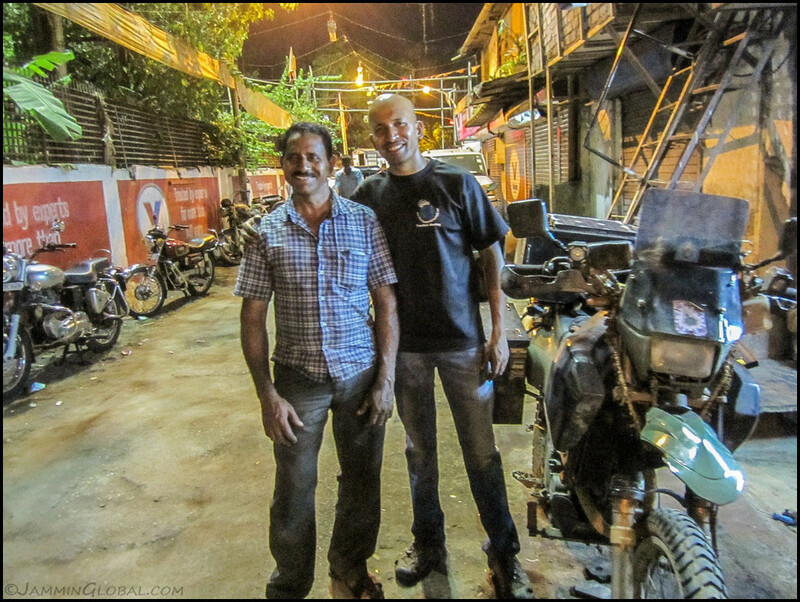 He comes from the Trichur district in Kerala and has been a mechanic here for 35 years, initially working on old British bikes and then due to a lack of parts, switched to working on Royal Enfield Bullets.